October 25, 2013 October 25, 2013 by Beau H.
I’ll be the first to say I’m no watch expert by any means. There’s certainly a significant debate out there on the quality and value of an automatic versus a quartz watch, and there are positives and drawbacks to each side of the conversation. Being able to throw on a timepiece and have it virtually operate itself (if you wear it long enough) is a pretty neat feat of machinery on the part of automatic watchmakers. And some swear by the price of a nice quartz watch. At the end of the day, however, both do the same thing: tell time. And more importantly, a well-constructed timepiece can complete an outfit, regardless of how it runs. It’s that accessory that doesn’t seem to be found on a lot of wrists these days, and the right watch can set the tone of an outfit: A Timex Weekender (featured here in the Under $250 Budget Challenge) is inherently more casual. It’s a cheap watch that can go anywhere and do anything. A dress watch (say, with a nice leather strap and minimalist design) in either brown or black covers the bases when it’s time to suit up. 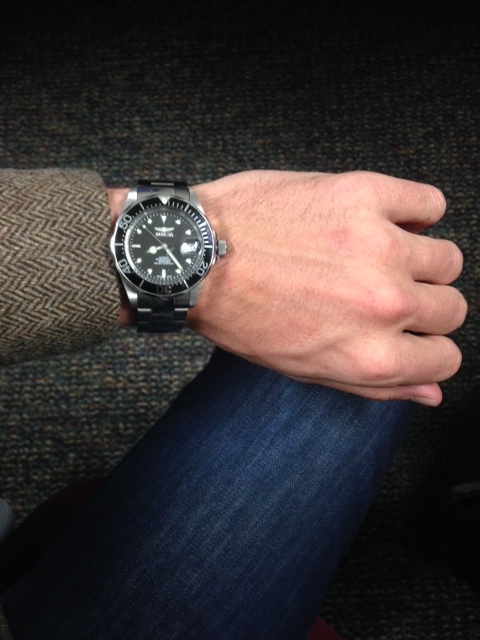 The rest of the time though, there’s hardly a watch more versatile than a stainless steel dive watch. If the shine on the links is low enough and the design isn’t too gaudy, a dive watch could function well with everything from a henley and jeans to a suit. Sure, they first started as a way to transition from the water to the clubhouse, but it works just as well even if you’re not hitting the ocean. The Invicta 8926 Pro Diver is certainly no different. I’ve only had it for about two to three weeks, but it’s treated me remarkably well. There are watches that are better-made, to be sure, but those watches also will set your wallet back a bit more. For the price, it’s one of the most affordable, best-looking divers on the market. It’s an automatic, and says it’s water-resistant to 200 meters. I haven’t run this one through the usual gamut of water-related activities, but I’d even considering wearing it to the beach – can’t be done, you say? Ask this guy. 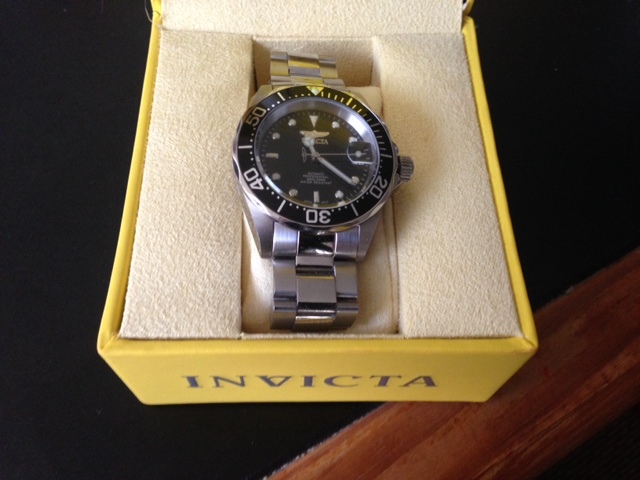 Packaged in a solid box with Invicta branding. It feels sturdy and substantial, and wears about to size (the case diameter is 40 mm, about the sweet spot for most people — not too big or too small).The watch’s screw-down crown makes it easy to change the day and date. As for keeping time, the watch runs smoothly – it rarely loses or adds a minute throughout the day (which can be an issue with some automatics). The watch on a fairly medium-sized wrist. Paired with J. Crew herringbone blazer. October 21, 2013 April 26, 2015 by Beau H.
Editor’s note: The following review was published in October 2013. To get an updated Hunt Club crate review and learn more about the brand, check out this April 2015 post, too. The Internet has definitely propelled men to think more about how they dress, and it’s also made it easier than ever to pick up great threads at affordable prices. There are some companies who’ve embraced this change wholeheartedly, and others who are new to the game (witness H & M’s first foray into the world of online retail earlier this year). Other companies also have taken advantage of the Internet to pioneer new and innovative approaches to clothing. 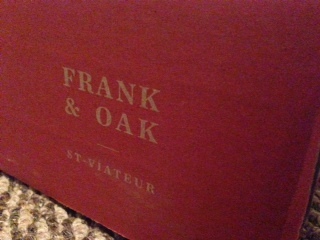 Frank & Oak is definitely one of those companies. They’re a relatively new arrival to the world of menswear, as it seems they’ve just picked up a lot of steam across the past year-and-a-half. On the other hand, they also seem to produce a lot of polarizing opinions as to the customer service and quality of some of their clothing. However, personal experiences have been nothing but fantastic with the company. Shipping does tend to take a bit longer because of international borders (the company is based in Montreal, Canada), but the quality is on-point. The monthly Hunt Club crate. For those who don’t know, in addition to the online store, shoppers also can join The Hunt Club, a monthly promotional deal that allows members to pick up to three items from new collections released monthly. Hunt Club membership also gets you discounts and special deals on sales. Items vary from month to month and often are extremely seasonally appropriate. Even better? You only pay for what you keep, a system that allows you to try out and wear items before sending them back, with free return shipping. Not a bad deal. The October issue transitions the company’s offerings from the in-between fabrics of early fall to a decidedly more-winter feel. Colors are darker and offerings include some very nice peacoats, thicker sweaters, wool trousers and a few rather unique offerings, like a herringbone zip-up jacket and a corduroy shirt in two different tones. The wool tie and Newport Chinos in Amber. My selection for this month’s crate centered around some essentials for fall and winter: a pair of their Athletic Sweatpants in Navy, the Newport Chinos in Amber, and a wool tie. The sweatpants (ordered down in a size Small for a slimmer fit) were comfortable and well-constructed, with a sturdy waistband and drawstring ties. Definitely a more unique offering from a clothing company, but F & O aims to outfit men head to toe, and also offers a lot of accessories, like backpacks and wallets. The Newport Chinos in Amber are exceedingly comfortable and slim, but offered only up to a 34″ inseam and 36″ waist, as of now. They fit like an interesting hybrid between a Levi’s 513 from the waist to the knee, and a 511 from the knee down — there’s a fairly significant taper, but the overall fit is tremendous if you enjoy slimmer pants. They’re also the optimal length to be cuffed. The wool tie has not come into the rotation as of yet, but would pair extremely well with a blue OCBD and a herringbone wool blazer, for example. For the time being, it looks like the items in this crate are all keepers based on quality and price. Have you had any personal experience with F & O? Leave it in the comments below. October 10, 2013 by Beau H.
Here in Michigan, temperatures are continuing to drop (yes, it’s happening!). With winter on the way for most of, layering should ramp up substantially. With that increase comes the need for some tried and true favorites, items that could easily be swapped out as part of a rotation and layered on top of and under. Enter the v-neck sweater. Crewneck sweaters definitely have their place in the world of style, and there are crazy good options out there, but v-neck sweaters never really seem to fall out of favor when it comes to style. In the right color scheme, they can be an indispensable part of a guy’s wardrobe. (They’re even part of Dappered’s “Always” list, as good of an indication of timeless style as any). 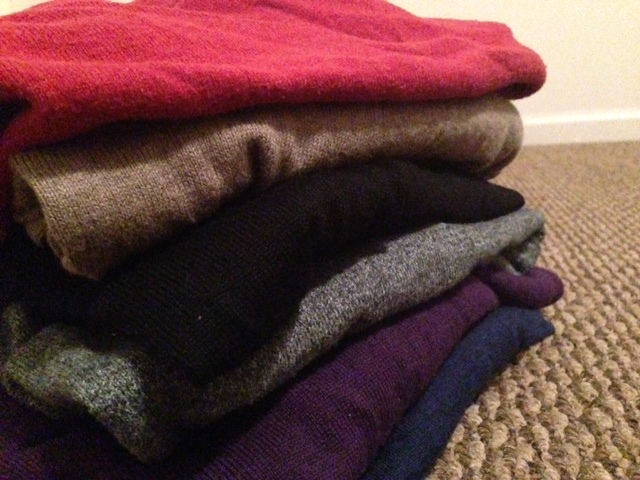 A plethora of v-neck sweaters. From top to bottom: Old Navy, J. Crew Factory, J. Crew, Old Navy, Express, Frank & Oak. V-neck sweaters should, like most clothing, skim the body but not fit too tight. Affordable options are out there by the dozens, recently at places like Gap, Old Navy and Uniqlo. Those price points are well within range for many, and the plethora of color options shouldn’t discourage you from wearing a brighter palette in winter. In fact, pairing a v-neck sweater with a blue or white button-down shirt, dark jeans and, say, desert boots could constitute a very worthy rotation of items. And in the dull days of fall and winter, v-neck sweaters provide that nice “it” factor when looking to work color into your wardrobe. In smaller amounts and possibly less luminous colors than those of summer, a nice shade of blue or a deep purple wouldn’t look out of place, either. Extremely splurge-worthy alternatives are on the market too, but for price points that are fast on the rise. For those of us not a James Bond budget, it’s hard to beat snagging a few on sale at a place like Old Navy. Some aren’t partial to shopping there, but on a budget, the quality is tough to pass up. 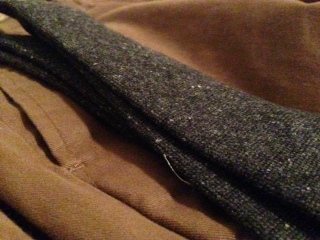 Three sweaters in the personal rotation have gotten heavy wear across the past winter and have held up more than alright. 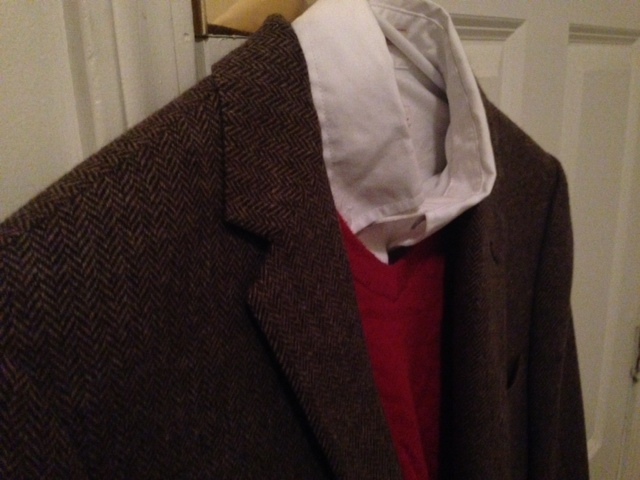 The classic Ludlow sportcoat in Herringbone English Wool, over an Old Navy sweater and Target Merona button-down. Outside of more casual options, v-neck sweaters work outstanding when paired with the right pair of slim corduroys, chinos or dress pants. Over a nice shirt and tie, the combination is killer. Underneath a blazer, too, a v-neck sweater provides an added layer of warmth and some visual appeal (as seen in the photo above). If the blazer is winter-weight (like that J. 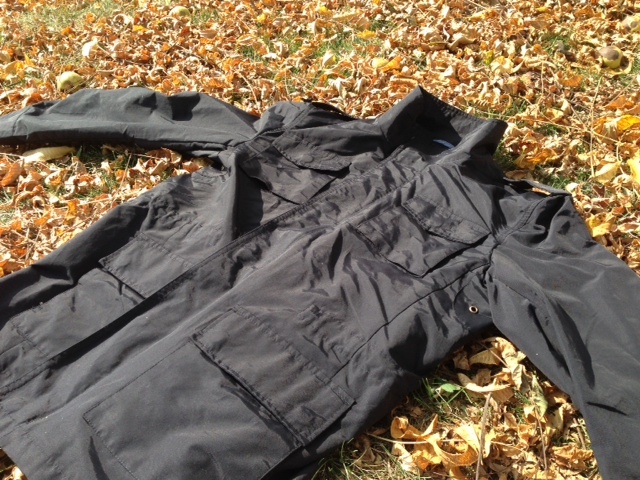 Crew blazer pictured ), the combination can work as seamlessly with snow on the ground as it can when it first gets bone-chilling cold. Wingtip boots might not be a bad add-on either, if the dress code calls for something a bit more polished. As far as other outfit components go, affordable blazer and dress pant options can be snagged at J. Crew Factory or Frank and Oak. While you’re there, don’t forget to stock up what could arguably be the most important (and basic) item in your closet this fall and winter — the v-neck sweater. October 4, 2013 by Beau H.
Fall is can be a tricky time for those of us interested in menswear. It’s not quite yet cold enough at this stage (at least in my neck of the woods) to wear heavy fabrics like tweed or a nice wool peacoat, yet there’s still the odd, slightly warm day. Transitioning between seasons like summer and fall is probably more difficult than transitioning between spring and summer or even fall and winter. A lot of it comes down to shelving bright summer colors and shifting to more seasonally appropriate hues. An even bigger part of the transition ties in recognizing textural differences and phasing fabrics out of your wardrobe (less lightweight linen or linen-cotton blends, and slightly heavier textures like corduroy, for example). A great guide to making the transition stylishly can be found here, courtesy the great team at Primer. Not quite warm enough for this lighter-weight Harrington jacket, but not quite full-on winter yet. Now, textural differences are also important in terms of outerwear, as layering multiple pieces in lighter or heavier weights can dress an outfit up or down. Keep in mind that something like a hooded sweatshirt or standard winter coat just won’t do for a polished option. Looking for a sharper military silhouette in a lighter weight is one way to harness the crisp appeal of a spring-weight Harrington jacket. Military-type jackets might be a bit trendy for some, but it can also bring som serious, slightly rugged appeal. With brands like Barbour, the jacket has surged back into the spotlight across the past year, thanks in no large part to a certain secret agent. Strong military-inspired details, a trim silhouette, perfect layering weight — the Aurora jacket from F&O. 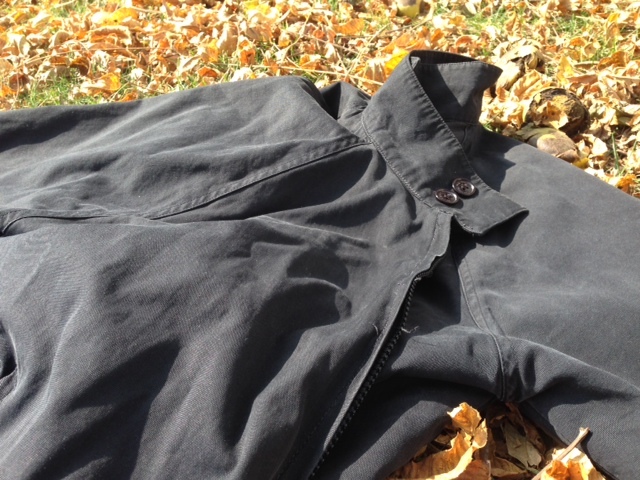 Now, that Barbour jacket is…well, on the pricey side, for all its great looks. Other, slightly more affordable options are out there by the dozens, it seems. Personally, the Aurora Military Jacket by Frank & Oak hits the sweet spot. The sleeves and body are trim ( in a size Medium), the armholes are high without being restricting, and the jacket’s lines are clean (there’s not much excess material anywhere). It’s still relatively lightweight and waterproof with a cotton-nylon exterior, but it feels more substantial. That means it can be tossed on over a v-neck sweater and an OCBD while still functioning well. If it gets too hot, strip off a layer under the jacket. Too cold? Add a denim jacket or another layer over a sweater and OCBD — and put that underneath the jacket. The price point is within reach for most (and if you’re a member of the Hunt Club, store credit could apply here, too). And, its military-inspired looks are on-point both stylistically and fashionably. Toeing that line can be tricky, but if there’s any jacket that can crisply and effectively cross the divide between fashion and style (as well as the start of fall and the start of winter), a strong military piece can be a tremendous wardrobe addition. 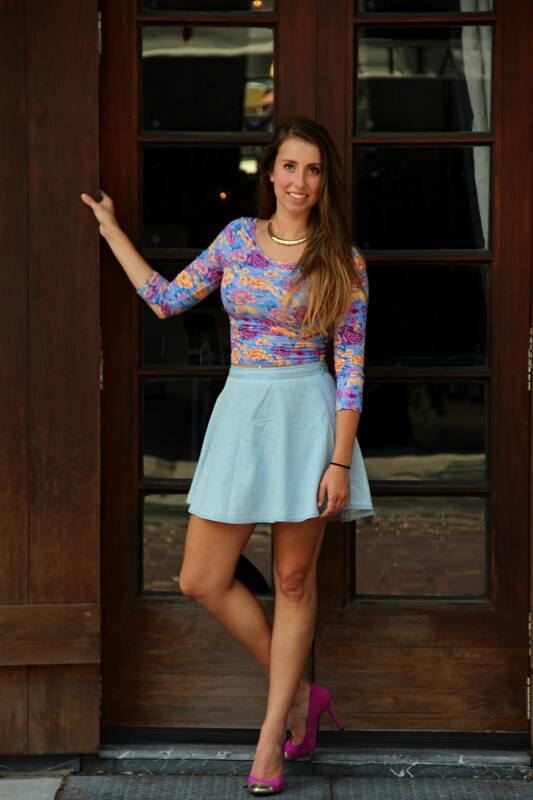 October 3, 2013 by Beau H.
I’ve been on the lookout for a denim circle skirt for months. I really love this one from American Apparel, but for a denim skirt the price is a bit high for me. I was browsing Forever21 the other day and found a very similar one for only $13.50. Obviously, I bought it immediately. Although this skirt is a light wash, I still find it very versatile and a great transition piece! I went to brunch in Winter Park, Florida, one of my favorite locations in Orlando, and paired this skirt with a long-sleeved floral crop top and two different pairs of shoes for two different looks. First, I wore my hair pulled into a sleek ponytail and my pink low-top Converse sneakers for a very sporty look. This was casual and comfortable for exploring the area. The denim skirt is lightweight, but still a great material for descending temperatures. Then I switched into my magenta heels from Target and let my hair down to dress up this look a little. The denim and heels play together well to be slightly dressed up, but still casual enough to wear during daytime. The skirt has great movement while still keeping its structure! I can’t wait to play around pairing more crop tops with this skirt for more casual looks. Check back soon for Part 2/2 where I style my denim circle skirt for fall! Thanks to Teresa for the pictures!